There’s a lot of buzz these days about the challenge posed to government officials responsible for our transport and traffic in Metro Manila and the rest of the country. I must admit I regularly drive between home and my workplace but I often commute to meetings and will usually leave my car at the office when I don’t feel like driving. While its often perceived as difficult to take public transport, it is really quite easy as long as you plan your trip. That is, familiarize in advance with what jeepneys, buses, UV express or rail lines your going to take. I’m sure there are so many tools available to those with smart phones or internet access but then nothing beats asking for directions from those familiar with the commute. Following are photos I took en route to a meeting at Bonifacio Global City (BGC) from UP Diliman. I took a jeepney from UP until the EDSA MRT Quezon Avenue Station where I took a train to Ayala Station. From Ayala Station, I walked towards the Fort Bus Terminal at the corner of EDSA and McKinley where I purchased a ticket at the Fort Bus booth beside the Shell gas station. Passengers queuing at the platform at Quezon Avenue Station – there is some semblance of discipline but not like what we saw in Japan, Singapore or Bangkok where people do step aside for alighting passengers before entering the train. A crowded platform vs. a congested EDSA – commuting is often perceived as a hassle for many in Metro Manila partly because of crowded public transport and the inefficiencies including poor transfers and low quality of service. Many who could afford to own cars or motorcycles take private vehicles instead. Passengers on a crowded platform form lines directly in front of the train doors instead of allowing for space for disembarking passengers. While there are markings on the platform to guide passengers where to position with respect to the door, these are not followed and there are no MRT staff to guide people to do so. Passengers lined up for an arriving train can be too close to the train, risking accidents where a simple nudge from behind could get a passenger killed by an oncoming train. The photo clearly shows the narrow platform of the EDSA MRT station and the markings to guide people where to position with respect to the train doors. This contributes to the congestion on the platform and perhaps is a reason why people can’t line up properly. I’ve observed many people getting stressed out simply because of the undisciplined mix-up during the unloading/loading process whenever a train arrives at the platform. Note also from the photo the sign on top of the guard post informing people of the segregation being implemented in favor of women, children, PWDs and senior citizens. The latter have some cars reserved for them so they won’t have to wrestle it out with other passengers to get in a train. A Taft-bound train arrives at the Quezon Ave. Station. On a way to increase the MRT-3’s capacity is to have shorter headways between trains. However, this can’t be done without additional trains. 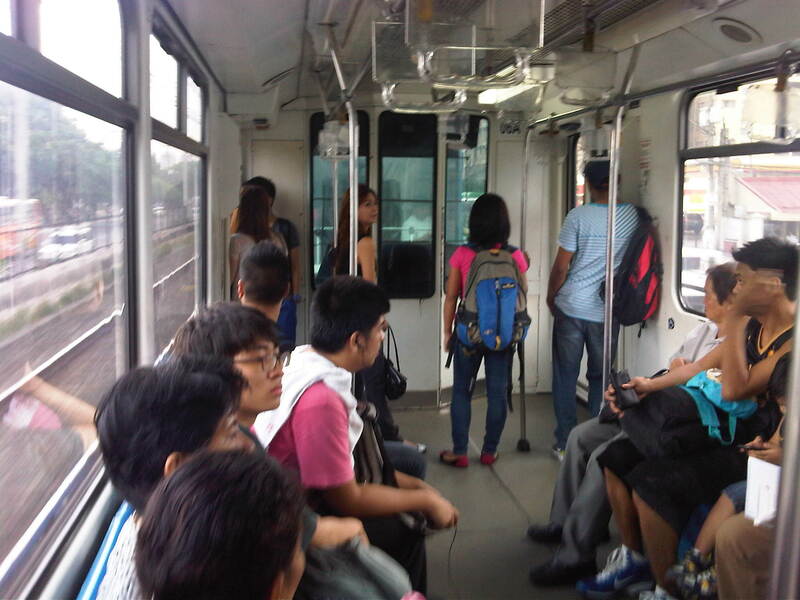 A train is not full as it leaves Quezon Ave. but more passengers board at subsequent stations at GMA Kamuning and Cubao. The train cars are eventually crowded and I stopped taking photos in case someone fancies my phone or gets offended by my taking photos inside the train. Escalators at the Ayala Station where the platform is practically underground. Small shops and stalls at the Ayala Station. There is a direct access to SM Makati, which a lot of people take to also have a more comfortable walk through the malls nearby. Ayala Station is one of the larger and more developed stations along EDSA-MRT and among the busiest given its location. Among the shops and stores at the station is a local courier service and a license renewal center of the Land Transportation Office (LTO). These cater to people on the go and quite convenient to commuters. Direction signs to guide passengers transferring to the Fort Bus of Bonifacio Global City (BGC). MRT stored value card – these along with the single journey cards may be pruchased at the stations. A stored value card is worth PhP 100 with the last journey assured regardless of the remaining balance in the card. As can be seen, the card has seen better days. However, the long-delayed common ticketing system for rail transit in Metro Manila should be implemented soon (crossing my fingers). Perhaps other ways can be explored like commuter passes for regulars including discounted ones for students and senior citizens. In Japan, for example, one can get such passes for 1 month, 3 months, 6 months or even a year, paid in advance for unlimited trips between one’s “home” station and “work” or “school” station. By d0ctrine in Public Transport, Railways, Transport Planning on August 23, 2013 .